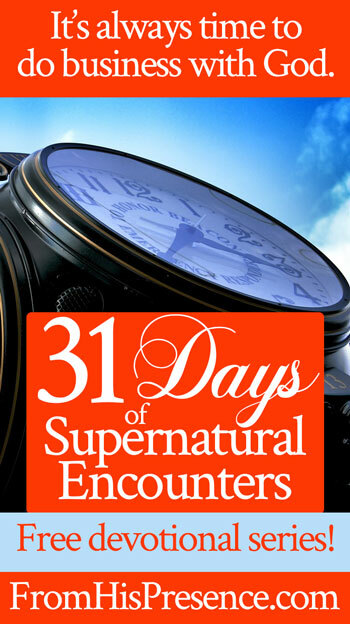 For Day 27 of our 31 days of supernatural encounters (series index here), we are talking about how to enter into deep prayer. Do you remember a time in which you began to pray, and you suddenly felt the Presence of God soooo powerfully? When you poured your heart out to the Lord, just knowing that He was listening … and felt your burdens roll away as you prayed? If so, can you also remember a time when you tried to pray, but you just couldn’t focus? When everything felt dry and ineffectual? When it felt like you were talking to yourself instead of talking to God, and you didn’t go out changed at all? The two kinds of prayer experiences are as different as night and day. I’ve experienced both, but I can tell you that I MUCH prefer the first type of prayer! Don’t you? The first type of prayer is a supernatural encounter with God. The second is a dry, boring exercise. So how can you enter into deep prayer every time? How can you connect with God in that amazing, intimate way without ever having to experience dry, boring prayer again? 1. Every time you go to pray, ask Holy Spirit to pray through you and intercede for you. Nearly every time I begin to pray, I pray this promise FIRST. I ask Holy Spirit to pray through me and intercede for me. If I remember to pray this promise first, my prayer time is amazing. It’s powerful, fruitful, and brings me into intimate encounter with God. But if I forget to pray this promise first, then–every time I forget–my prayer time is dry. I can’t focus, don’t know what to say, and don’t feel the Presence of God. Moral of the story? If I’m in a time of dry prayer, then I remember why. I back up and ask Holy Spirit to intercede for me and pray through me. And as soon as I do, everything changes and I’m suddenly in deep prayer. 2. Enter into His gates with thanksgiving. The “gates” are the first thing you cross when you’re going in somewhere. And the Bible tells us that we enter His gates with thanksgiving. It’s amazing how thanking God will help bring you into deep prayer. In fact, giving thanks will bring you into intimate encounter with God anywhere, even if you aren’t specifically sitting down to pray! But when you do begin to pray on purpose, start out by giving thanks. How? If you’re feeling thankful, then it’s easy. Start out by giving thanks for everything you’re feeling thankful for, and go from there! And if you’re not feeling thankful, you can give thanks too. When I’m not feeling very thankful–e.g. if I’m upset about something–then I know I need to give thanks anyway, and do so purposefully. So I start out just thanking God for everything around me. I just start thanking God for any little thing I see around me; for anything I can think of. And you know what? If I start out with a bad attitude and don’t feel thankful, pretty soon giving thanks changes my attitude. So either way–whether you feel thankful or not–enter into His gates with thanksgiving. 3. Enter His courts with praise. After you’ve asked for Holy Spirit’s help to pray, and after you’ve entered into His gates with thanksgiving, it’s time to enter into His courts with praise. The “courts” are the very place where God sits. When you’re in His courts, you’re in the inner place of His Presence. It’s a great place to be! So how do you get there? You progress from thanking God to praising Him! Praise is different than thanksgiving. Thanksgiving means thanking God for what He has done. But praise means to tell God who He is, and to worship Him for who He is. Praise gets you into the inner courts of the Lord. So if you want to enter into deep prayer, with Holy Spirit’s help, start with thanksgiving and then move into praise. It works every time! And after you’re in His inner courts, pour out all your heart to Him. Holy Spirit will help you, and you’ll have a powerful time of prayer that is a supernatural encounter with the Living God. “Heavenly Father, I come to you in Jesus’ name. Father God, thank You for Your Holy Spirit who lives inside me. Thank You, Holy Spirit, for interceding for me and through me. Please pray through me and for me right now. Lord, I want to enter into deep prayer every time I commune with You. And Lord, I want to commune with You every moment of every day. I don’t want there ever to be a time when I feel separated from You. So Father, please help me to always remember to ask Holy Spirit to help me pray and pray for me and through me. Help me to remember to thank You and bless Your name, and help me to praise You all day every day. Lord, I want to be a person of prayer. So please do a work in my heart and teach me to pray. Help me to enter into Your gates with thanksgiving and into Your courts with praise always, and help me never to go out. I don’t want to go in and out of Your Presence, Lord. I just want to stay with You and remain. Help me do that, Father, and thank You. Listen to Eddie James singing “Lord, make me a house of prayer!” and ask the Lord to make YOU a house of prayer too–and that the fire on your altar would never go out! Thank you so much for this word and for your spiritual guidance. Read it over twice. With all my challenges I still find it so hard to pray. I am going to try this right now. Thank you thank you!! I was feeling guilty when this dry moment occur, now I know to reconnect to a powerful deep prayer I need to call the Spirit of truth to pray through me, thank God and praise. God bless you. Thank you so much for this beautiful article and wonderful words of encouragement on Prayer. The song also is beautiful and inspiring. May the LORD continue to BLESS and use you to be the BLESSING you are to the Body of CHRIST! Love and Prayers!!! Ah yes … Make me a house of prayer, Thank you for this awesome song to remind us and to show us that the fire on the alter should never go out. The Holy Spirit has amazing power and is always willing to help… kind of like you.. thank you for being the mentor and trail blazer for many of us. Thank you very much Jamie for the word of encouragement and reminding us on how to pray. I’m inspired and God bless you always. This is how you pray without ceasing. And it drives out the thieves so we can be a house of prayer. This encouraged me because I thought my dry prayer life meant God wasn’t listening. I am putting this into practice tonight. Thank you for posting this and being in the Spirit. Lord make me a house of prayer, beautiful words. I had never heard of asking the Holy Spirit to pray for me like this. I have asked the Holy Spirit to intercede for me but not every prayer. Thank you Sister for bringing awareness to this very important part of prayers. In my moments where it at times felt fruitless to pray, I would guide myself to give prayers of thanksgiving, as I felt God had done enough and wasn’t ready to do more, I know now that was the enemy causing me too think that way. I pray the fire on my alter never goes out. Powerful prayer Jamie. Thank you very much! This prayer shifted something in my spirit realm and the heavenly realm. Increased Intercession, entering into his courts with thanksgiving and praise. I bless you coming in and going out In Jesus Name. Thanks I have been doing as you have mentioned here, I have perfected my prayer. Thank you dear. May the Holy Spirit continue to use you mightily to reach out in Jesus ‘ mighty name. 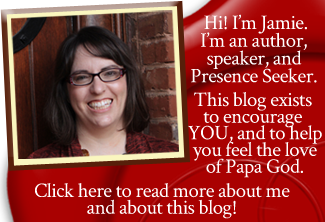 Thank you Ms. Jamie for opening my eyes about praying. There are lots of things I have learned from here. May God continuously Bless your site!